Home  Latest News  Supplier of the Year 2015! Supplier of the Year 2015! 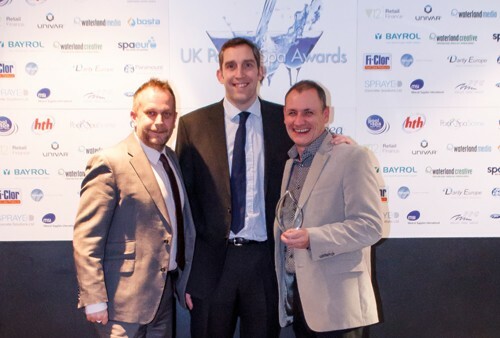 Paramount Pools walked away from the 2015 Pool and Spa Scene Awards this year once again holding the trophy for Supplier of the Year – one of the event’s most prestigious awards, which has come home with us for two years running. The event was held over the Pool and Spa Scene Expo, from the 23rd to the 25th of January. In its sixth year, the Awards were much bigger than ever before, covering 21 categories and with around 4000 businesses involved at the NEC in Birmingham. 1800 votes came in from online sources which made up 40% of the total number – the other 60% was voted on by industry expert judges. As in 2014, the Olympic medallist and sports personality Stephen Parry, who also owns the Total Swimming business, was given the duty of handing out the awards. He said, “Having spent most of my life in and around swimming pools, the pool and spa sector is particularly close to my heart. We were also thrilled to have sponsored the Special Acheivement Award, which this year went to a pool tile manufacturer in Stoke-on-Trent named Johnson Tiles – the company who created the Tower of London moat from ceramic poppies just last year. Over 400,000 ceramic poppies were handmade to represent each British soldier who died in World War I.